We are always delighted to hear from former Middlesex nurses and to have new members. Please use the bar above to navigate your way around the site, to find out how to join and what is going on. The Middlesex Hospital Nurses’ League was founded in 1931. On becoming a charity in 1974 it became known as The Middlesex Hospital Nurses’ Benevolent Fund. It was set up originally to enable Middlesex nurses to keep in touch with each other. This role is continued today through the annual Journal which is sent to 750 members all of whom wish to maintain the bond with past Middlesex Hospital nurses. One of the early purposes was to maintain a Benevolent Fund for all nurses who were trained at or served on the staff of the Middlesex and who find themselves in financial need. The Fund continues this tradition and also awards bursaries for further professional education and training, in memory of Miss Elsie Pearce who trained at The Middlesex in 1915. The Middlesex Hospital, which stood on Mortimer Street for 250 years, closed in 2005. It had amalgamated with University College Hospital in the mid 1990's and the final remaining services were transferred in 2005/6 to the newly built UCLH in Euston Road. The 16 storey tower was named The Middlesex Tower in honour of the hospital. The main Middlesex Hospital building was demolished and the site on Mortimer Street was sold for redevelopment. Very little of the original hospital remains: only the front elevation of the Radium Wing and the Chapel are still standing. The Chapel, which has Grade 2* listing, is protected and as part of the planning agreement with Westminster City Council it was restored and provided with a dowry. A charitable foundation has been established to fulfil a public benefit role. The chapel, now known as Fitzrovia Chapel, is held on a 125 year lease by The Fitzrovia Chapel Foundation. It has been beautifully restored and has a new entrance on the eastern side. The open space around the chapel has been landscaped and a sculpture by Peter Randall Page has been installed outside the north eastern end of the chapel. The change of name of the chapel aroused strong feelings from local residents, past patients, and the hundreds of past members of staff who had worked at The Middlesex. However despite the huge public outcry the name Fitzrovia Chapel has remained. The Middlesex Hospital Out-Patients on Cleveland Street is also a listed building, Grade 2 and is thus protected. It is owned by University College London Hospital NHS Foundation Trust. The four huge Caley Robinson paintings known as The Acts of Mercy, which were displayed in the front hall of the original hospital from 1912 and in the new hospital from 1935 onwards, were sold to The Wellcome Foundation Library and have been on public display ever since. 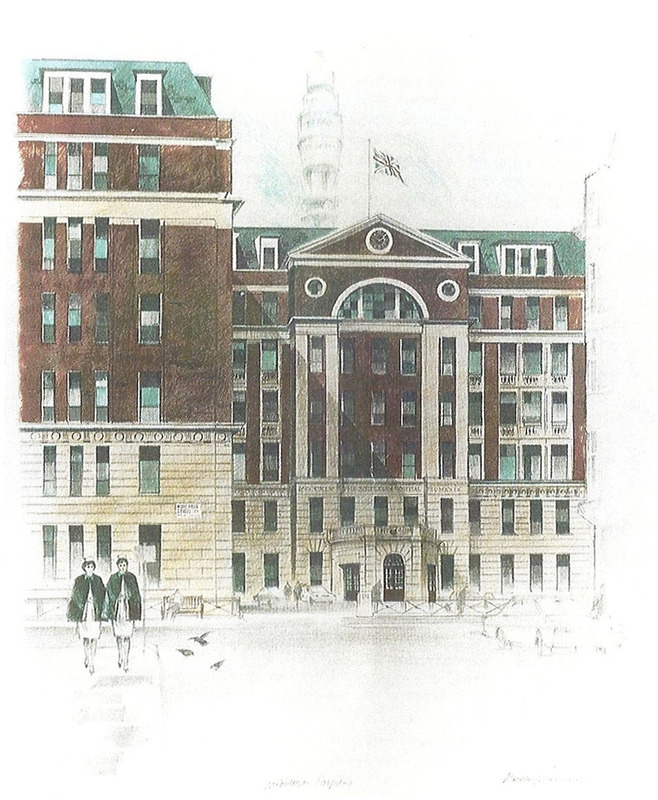 The Middlesex Hospital may no longer exist but the legacy of the work, achievements and traditions fostered by those who cared for the sick and trained there, still endures.